Turbines, Inc.’s HP Series Flow Meters offer accurate liquid flow metering and control for oil and gas applications. These rugged, durable high pressure flow meters are part of our complete line of innovative, industry-leading flow meters and flow metering equipment. They have earned a global reputation for their high performance and longevity in harsh oilfield and refining environments. 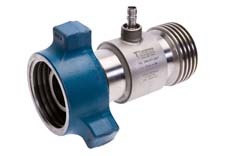 Manufactured using stainless steel construction and direct connection WECO®, API®, or other hammer union-style end connections, our HP meters are NIST traceable. Our flow meters are engineered and manufactured to be accurate, precise, reliable, and durable, providing high performance in demanding industrial environments. Turbines, Inc. products are ISO 9001 and AS 9100 compliant and Canadian CRN certified.